You may choose the language of your stamp set (English or French; Spanish speakers may choose the English set or Pedacitos espeluznantes [Spooky Bingo Bits in Spanish]). The printer's tray included in the kit is limited to this kit. This isn't offered anywhere else. 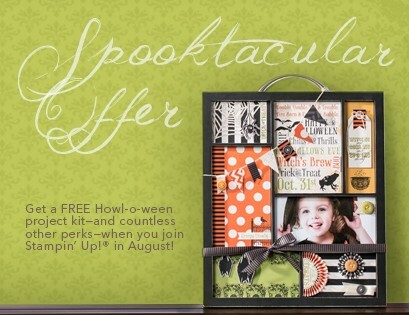 New recruits will receive their Howl-o-ween Printer's Tray project kit with their Starter Kit. New recruits will have until October 31 to redeem their free project kit. Paper IDA: Must be received in Stampin' Up! office by Friday, September 14, 2012; 6:50 PM (MT). Online IDA: Must be submitted by Sunday, September 16, 2012; 11:50 PM (MT). If the above deadlines are not met, but the demonstrator still qualifies because of a special exception, she will be able to order the Howl-o-ween project kit on Tuesday, September 18, 2012. While the $99 price tag is exciting in and of itself, one of the biggest perks of the new Starter Kit is its flexibility! Not only will you get a great deal on Starter Kit products (up to $125) that you get to choose yourself, but you'll also get a 20 percent discount on Stampin' Up! products when you place orders in the future. You have free access to Stampin' Connection (an exclusive 30,000 member only stamping community) and invitations to Stampin' Up! events-not to mention the fantastic new friendships you'll forge and regular opportunities to get together and stamp. These two are my favorites: You will have sneak peeks of product, promotions and catalogs before anyone else! You will also receive a FREE demonstrator monthly magazine filled with beautiful photos, project ideas and tips to run your business! Like I said, I absolutely LOVE having these two perks as being a demonstrator. The magazines have awesome ideas that you can't get without being a demonstrator. In addition, new demonstrators are eligible for TWO FREE months of Demonstrator Business Web Services (DBWS)-including your own business website and Online Store, access to a blog, calendar, a monthly e-newsletter, project gallery, and e-cards-when you sign up within 21 days of becoming a demonstrator. So if you are ready to join my team for $99 and receive your FREE tray head to my site http://brittnysmith.stampinup.net than click on "Join the Fun" Contact me if you have questions about being a demonstrator and I will gladly help. You can email me at brittnycreates@gmail.com with your questions or give me a call. We can even meet up if your local for a chat and receive a treat on me.